Worlds of Affect: Virtual Geographies of Video Games, by Ian Shaw and Barney Warf. A draft of the theme issue introduction, co-written with Rob Kitchin and Matt Zook, is also available: How Does Software Make Space? 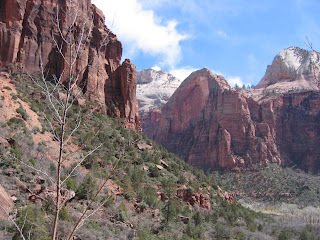 Exploring Some Geographical Dimensions of Pervasive Computing and Software Studies. I also co-authored a paper for theme issue with Rob Kitchin, titled, Software, Objects and Home Space which is forthcoming in June issue of Environment and Planning A. Through a series of interrelated developments, software is imbuing everyday objects with capacities that allow them to do additional and new types of work. On the one hand, objects are remade and recast through interconnecting circuits of software that make them machine readable. On the other, objects are gaining calculative capacities and awareness of their environment that allow them to conduct their own work, with only intermittent human oversight, as part of diverse actant networks. In the first part of the paper we examine the relationship between objects and software in detail, constructing a taxonomy of new types of coded objects. In the second part we explore how the technicity of different kinds of coded objects is mobilised to transduce space by considering the various ways in which coded objects are reshaping home life in different domestic spaces. 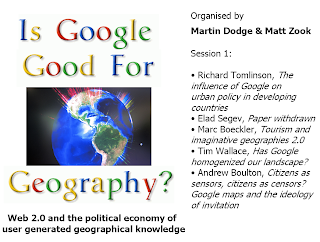 I also co-organised a successful double session discussing Is Google Good for Geography, with Matt Zook. Despite being on the last day of the conference we had a packed seminar room. 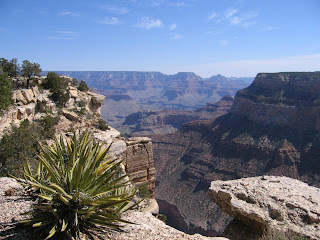 Here is a small selection of photos from a recent trip to the USA and visits to some lovely national parks in Arizona and Utah. 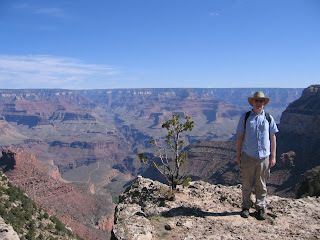 Geographer at the canyon - typically touristic shot. 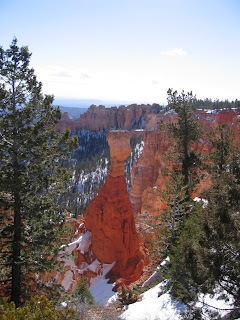 A view of a pillar of stone at Bryce Canyon. 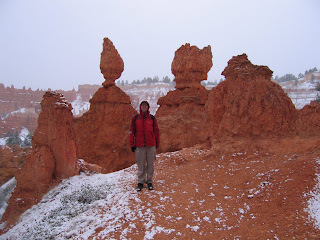 Another shot of me in a small snow storm at Bryce Canyon. 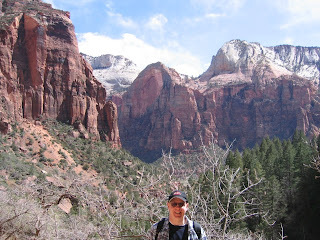 Me again, this time at Zion national park, which I thought was stunning.